I tried so many brushes before this one. None of them worked worth a dime. I tried combs too. Nope!!! Those stink too. I love Peter's products in the woven grasses and buy them all frequently for my bun-buns, so when I came arcross Peter's Brush, I thought I'd try it since I love the rest, and what do you know? It is excellent!!!!!!!!!!!!! My poor bunnies needed a good brush so badly. I groomed them all the time with the other brushes and combs and it go us no where fast. They had terrible shedding and hair building up that would not come out no matter how long I brushes or combed, and the shedding all over the place was terrible. I was at my wits end when I came across Peter's Brush and it did NOT fail me. 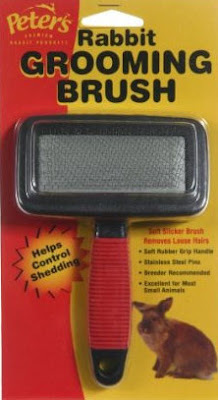 This brush had my buns fur in excellent and beautiful condition inside of a week. It works exactly as they all should, but don't. No keeping them groomed as they should be is easier on both me and them and they look beautiful and are so much more comfortable and healthy, because the better you keep them groomed the less hair they will have to process.